Hoi An has two seasons. Dry season runs approximately March until September; rainy season falls from around October until February. In terms of temperature and humidity, February to April is usually the most pleasant. Temperatures soar between May and August, and you’ll learn the reason why the locals do work in the early morning and siesta in the midday. The high tourist season coincides with Central Vietnam’s wet season, when the seas are rough and at times the rain can feel never-ending. 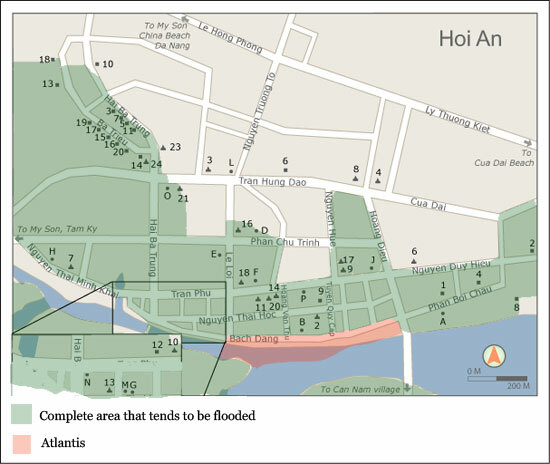 There is a risk of typhoon, and from late October to mid-December Hoi An’s old town is prone to flooding -- the town sits on low ground surrounded by waterways and mountain ranges, and then there’s a tidal influence as the main river meets the sea. Hue is looking better and better. 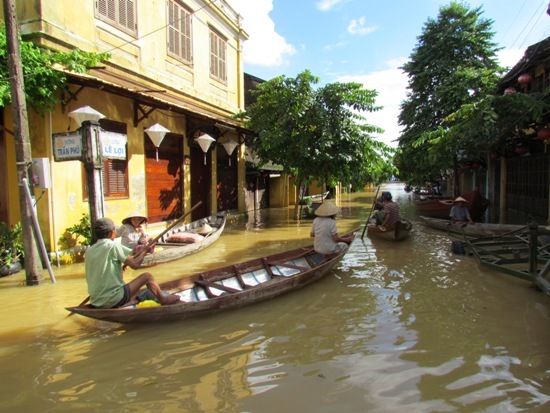 While flooding isn't guaranteed (there were none in 2015), if you are travelling Vietnam during this time and Hoi An is coming up on the itinerary, it’s best to check the latest situation and forecast. Some years it's only knee-high waters on a handful of days; in bad years, the waters have risen up to two metres high and with mudslides in the nearby mountains, it’s been severe enough for the whole region to be classified as a disaster area. If there’s a real risk, then check into a hotel that occupies high ground -- that means most of the guesthouses north of Ly Thuong Kiet Street. Most An Bang and Cua Dai Beach accommodation are safe bets but the popular backpacker accommodation street Ba Trieu is considered in the flood zone. Taking a sampan boat down to the river. If for some reason you decide to stay in the flood zone, be sure to request a room above the ground floor. Travel in and out of Hoi An is generally not affected unless there's a typhoon, though many businesses shut their doors during floods, so think twice before prepaying for anything such as cooking classes and tailoring. Before you panic, bear in mind that the typical floods are nothing to be too frightened about -- the waters usually recede almost as quickly as they arrive, and no matter where you are, high ground is never more than a few hundred metres away. The coldest months are November to January, and combined with the wet coastal weather, it can be downright chilly. It’s not all bad during rainy season though. There are occasional dry spells and warm, sunny days to be pounced on and a day at the beach is not out of the question. Usually low season in a popular tourist destination means rubbish weather and a seasonal shutdown of things to do. For Hoi An, it’s the complete opposite. From May to July, when the crowds are thin, it’s perfect beach weather in this region, with temperatures averaging around the mid-30s Celsius. There’s great local atmosphere at An Bang Beach or the public stretches of My Khe Beach. Low season is also good for bartering down the tailors and room prices become surprisingly affordable — look for an online deal, upgrade a star or two and you’ll still remain within budget. Diving and snorkelling is best between April/May until the end of dry season; the optimal time is from June to August, with warm weather and good visibility. 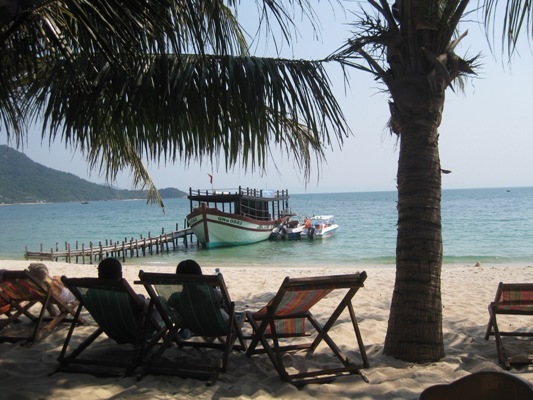 Cham Island is also seasonal; tourist boats don’t make the journey during rainy season’s rough seas. Lazy days and diving on Cham Island. The full moon is a special time to find yourself in Hoi An. No, it’s nothing like the hedonistic Ko Pha Ngan Full Moon parties. On the 14th day of any lunar month, it’s the Lantern Festival and the old town is aglow with colourful lanterns, lively gatherings and ceremonies. If you are looking for a beach party, Cham Island Diving does hold an all-night full moon party on the beach at Cham Island: barbecue, bonfire, dancing, night swimming and sleeping under the stars. The full moon is most brilliant in July and August. More moon worshipping: the Mid-Autumn Festival, also known as the harvest or children’s festival, takes place the 14th and 15th day of the eighth lunar month, usually falling in September. 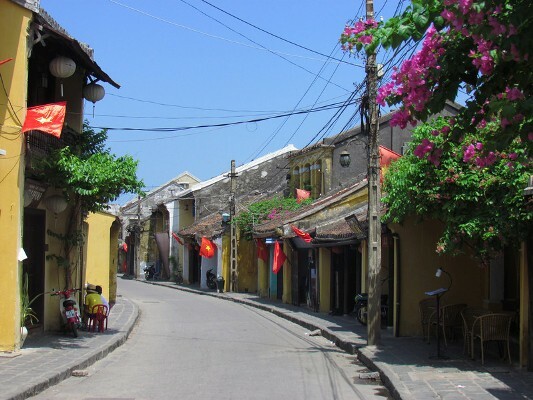 While it's celebrated throughout Vietnam, Hoi An is a particularly good place to be. Excitement builds up in the weeks leading up to it, as children ready their costumes, perfect the dragon dance routine and friends and family give each other moon cakes. The evening of the big day is a large procession with drums, cymbals, dragons and crowds making their way throughout the town. 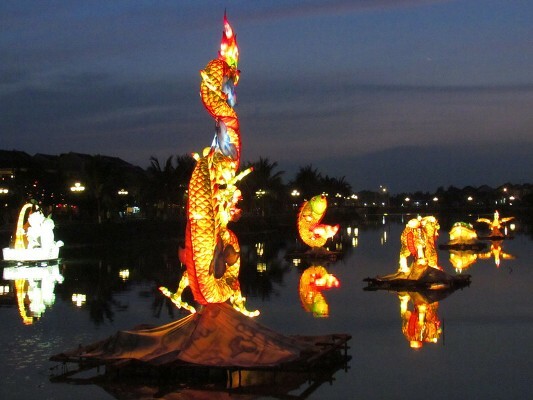 Half Tet celebrations in Hoi An for the year of the dragon. But the king of holidays is Tet (Vietnamese New Year), usually falling in January or February. It’s the most important holiday of the year. As with all tourist destinations in Vietnam, if you’re going to be there during Tet, then book well in advance and be flexible with your plans – or avoid it altogether. That said, Hoi An is one of the top destinations to experience these crazy, fun and confusing holiday celebrations. Read our guide to Tet. To experience “Tet-light”, try half-Tet in June. It is far more appealing than Tet, when Vietnam closes down for a week and prices double. Half Tet is just a one-day family celebration, with fishing villages hosting dragon boat races to please the gods, the winner bringing good fortune to the village in the coming fishing season. In the evening, children parade through town with brightly coloured lanterns, releasing them on the Thu Bon River sparkling with thousands of candles. It’s quite possibly the most beautiful festival of the year, and Hoi An is one of the most popular places for the Vietnamese to celebrate it.